An invitation arrived by email asking if I'd like to participate in a bloggers press trip to the Loire Valley, and in particular the area surrounding and including the city of Angers. I expect we are all very familiar with Pouilly Fume, Sancerre and Chinon as being very good quality wines in the East of the Loire valley. Then to the West, near Nantes, we have the ever tasty and moderately priced wines of Muscadet. So what lies between that could tickle the taste buds and evoke in the mind the landscape of a romantic, regal, undulating and effervescing countryside with majestic chateaux set against the bulging body of the Loire river and its branches, tributaries, off-shooting-arms and oxbow lakes? 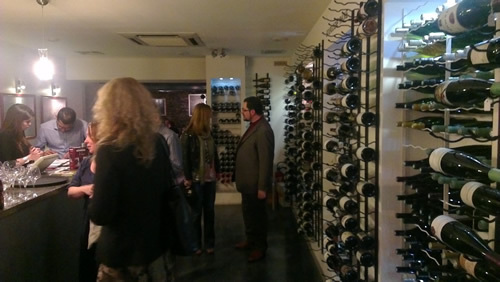 Five wine bloggers, one food writer and a young representative from City Airport were about to find out. Flying from City Airport is a new one for me. Living in West London, I love the easy access to Heathrow and, at the opposite end of the spectrum, loath the trek to Standstead, which is an awful journey. City is quite far away but is so easily accessed by a combination of tube and the DLR that there is minimal stress. I arrived a few minutes late and met Geraldine, the representative from LCA who walked me through to the restaurant after checkin. I was delivered to the end of a table that had seated on stools on either side my fellow bloggers for the trip and at the end the airport restaurant manager and Harish, our trip chaperone. Immediately a glass was thrust into my hand and an inch of Chateau Pierre-Bise Savennieres Clos de Coulaine 2010 was poured in. I received a quick glimpse of what would lie ahead in this high up and exposed part of the Loire. The wine mingled happily with a duck and coarse pate... a perfect start to the trip. It has a combination of subtle fruit, dryness and a complexity that compliments the strong flavours of the meat and raises the pleasure level a few notches. This particular route is what BA are calling one of their new range of “wine flights” to take passengers to wine regions where they can indulge themselves in the landscapes, people, food and wine; a combination which constitutes the character, or, spirit of the place. Anger airport was tiny and we were out in minutes and on our way to Anger. After checking in we were aware that there was much wine tasting to be done but our guide had one cultural course for us to digest. I didn't know this before leaving but the castle in Angers is home to the largest medieval tapestry in the world. The 'Apocalypse De Angers' A series of tapestries woven for Louis I, Duke of Anjou (1373-87), depicting in great detail the gospel of Saint John, known as the 'Book of Revelation' or the 'Apocalypse'. It is around four metres high by one hundred metres in length. Despite my own personal ignorance regarding this masterpiece people travel from all over the world to see it in in large long darkened gallery in the bowels of the castle enclosure. If you are visiting then take the time to be led through with the audio guide as it is a good way to imbibe this visual cocktail of symbolism and artistry. I enjoyed it and reaffirmed with my art historian friend, Fred, on Saturday that it is indeed a world famous masterpiece of great importance. Emerging from this thought provoking sideshow of apocalyptic doom, I bumped into the others who were assembling with a view to making our way to the next rendez-vous point, La Maison Des Vins De Loire. Images of the devil spewing frogs were instantly a thing of the past as we made our way across town to the incredibly well designed tasting rooms where places were set and the wines were ready. 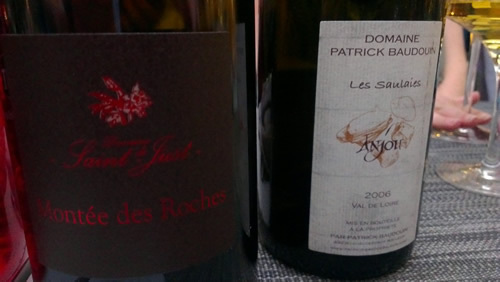 The joy of coming to this part of the Loire valley is made better by the fact that the wines produced surrounding Angers defy expectation. The Loire river runs through the valley travelling along changing ground where violent events in deep geological time shaped the land and give it is varied composition depending on where you are standing. It is this variety and geological difference that is a real gift to wine makers who toil for their own expression of what nature allows. Crement de Loire, Sparkling wine made from a blend of chenin blanc, chardonnay and cabernet franc. This less famous cousin of champagne is made in the same way and represents great value for money. I picked up aromas of marzipan and white fruits on the nose and in the mouth it was wonderfully dry and fresh. I could picture enjoying a bottle of this with a large bowl of moules marinieres and some lively banter. Rough price guide at £9-10* a bottle. Chateau Pierre-Bise, 2009, Anjou Blanc – Lovely honeyed nose with hints of oak. To taste I enjoyed the fruit sweetness (as opposed to sugar sweetness) of light apricot and easy going bright acidity. Very good value retailing at roughly £5 a bottle. Chateau Yvonne “La Folie”, 2010, Saumur Champigny – This deep ruby red was almost, but not quite, opaque in colour. Hints of dark red fruit, combined with a smokey, flinty nose. To taste it had fresh blackcurrant with a good presence of tannin and intensity. Very enjoyable and, again, great value retailing for about £8-9* per bottle. 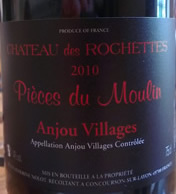 Chateau des Rochettes, Pieces du Moulin, 2010, Anjou Village – this is a young wine with a big fruity nose and a lot of well rounded tannin in the mouth. 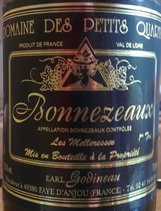 It is rich and meaty and would happily snooze in the cellar for a few years during which time the big tannin would give way to more complex flavours and imbue more pleasure upon the patient drinker. More good value at £8-9* a bottle. 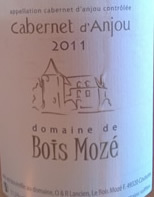 Rose cabernet d'Anjou, Domaine de Bois Moze, 2011- deliciously sweet oozing aromas of strawberries and honey. “Chill and drink, chill and drink...” this is such a mild and easy drinking wine, one would not know when to stop. A perfect accompaniment to melon and cured ham. Our hostess made an intriguing suggestion of Tagine. I'll try it for sure. We assembled once more and our ever assured guide, Harish led us from the hotel to the 'Mets Et Vins Plaisirs' restaurant where, as the name suggests, pleasure with meat and wine were in store. This restaurant was almost invisible from the street but once inside it was a busy place where the name really did seem to ring true. It was also a good time to reflect amongst ourselves on the #LoireTrip thus far. 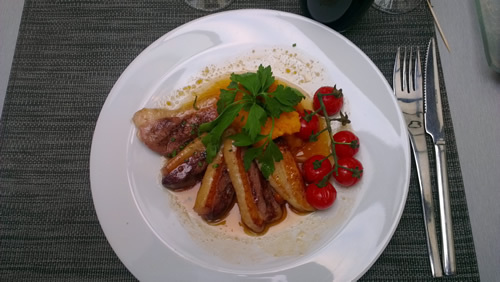 Here are some pictures of the food and a couple of the wines. The notebook didn't make the evening shift but from memory I can honestly say I had a good run in with satiety! 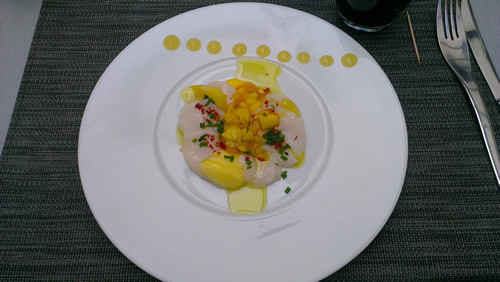 *Prices quoted are estimations given by our host on the day and likely variable.